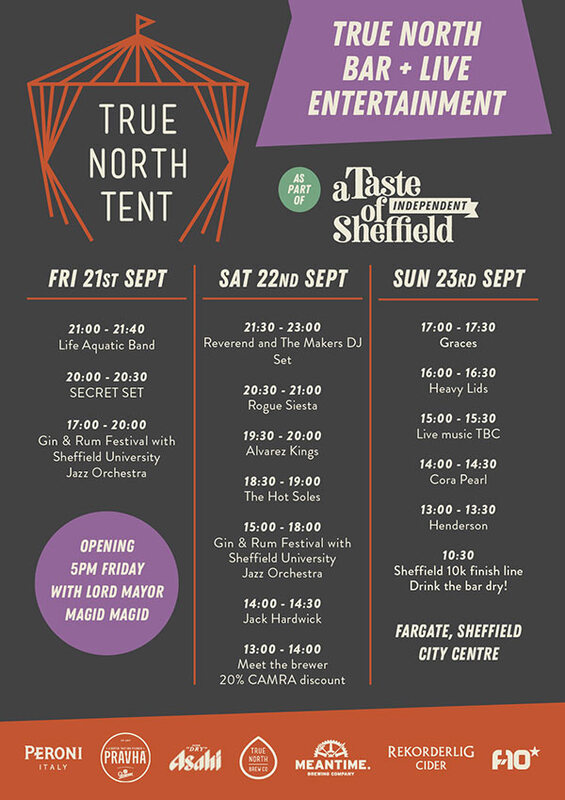 Taste of Independent Sheffield, a free city centre festival taking over Fargate and the Peace Gardens this month, will be showcasing some of the city’s finest musical talent in the True North Tent from Friday 21 – Sunday 23 September. The event has been organised in conjunction with True North Brew Co and Timm Cleasby from Tramlines Festival to promote independent food, music, arts and crafts in the Steel City. The local music on offer – all entirely free to watch – ranges from Hot Soles’ rambunctious rock’n’roll to the multi-genre influences of alternative five-piece Life Aquatic Band. It’s also been announced that Reverend and The Makers frontman Jon McClure will be rounding off Saturday evening with a DJ set. The weekend will coincide with the return of the city’s students and the Sheffield 10k, so organisers are expecting a bustling atmosphere at the event. For the latest lineup announcements and times see the flyer below. For a full list of what’s on, including news of the gin festival taking place over the weekend, head to the Facebook event page.